This semester, you will use two different software systems for submitting your work. 1. Technical Assignments (“Assignments“) are submitted privately through Autolab. The only people who will see this work are you, the professors, and the course teaching assistants. Instructions for using Autolab are below. 2. Open-Ended Creative Assignments (“Projects“) and “Looking Outwards” reports are submitted publicly, through this WordPress website. Instructions for submitting assignments in this way, using this WordPress site, are here. If you need to submit any work electronically, create a zip file of the file(s) you wish to submit. Please be sure to create a .zip file and not a .gzip, .tar or .rar file. See below for instructions on creating a zip file. Go to the Autolab website (https://autolab.cs.cmu.edu/) . You must log in (authenticate) using your CMU Andrew ID and password. If you are registered for this course, you should be able to log in and see that you are registered in 15-104 (Fall 2015) or 60-212 in Autolab. IF YOU ARE REGISTERED BUT DO NOT SEE THIS COURSE, THEN EMAIL YOUR PROFESSOR IMMEDIATELY. You should see links for currently active assignments that you can hand in. Note that on most weeks, there will be multiple assignments. Click on the link for the assignment you want to hand in. Once you click on an assignment, you will see an Options menu. From here, you can download the assignment handout (i.e. starter code, if any), handin your .zip file, view your handin history or view the assignment/lab writeup instructions. To hand in, select “Handin your work”. You will see a text field to enter the filename you wish to submit. You can use the browse button to find the .zip file you want to submit. Once you select the correct file, click the Handin button to submit your work. You may submit as many times as you wish up until the deadline. WE WILL GRADE YOUR LAST SUBMISSION THAT WAS SUBMITTED ON TIME. DO NOT HAND IN YOUR PROGRAM FILES VIA EMAIL TO YOUR INSTRUCTOR OR COURSE ASSISTANT. THESE WILL NOT BE GRADED! FILES SUBMITTED AFTER 11:59PM ON THE DUE DATE ARE CONSIDERED LATE. Please review the course late policy for more information. A zip file is a single file that contains copies of a collection of files in a compressed format. Since assignments often contain multiple files, a zip file is a way to transfer not just the content but the organization of the collection of files needed to run your programs. You can make zip files using command line tools or graphical desktop tools. Note that in all cases, you should name or select the containing folder for all your project files rather than selecting individual files! 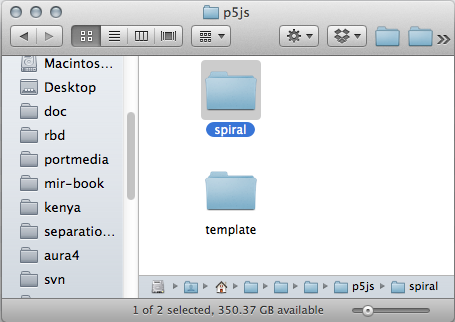 Finder window with project directory selected. The Compress item appears 4th in the pop-up right- or control-mouse menu. After selecting the Compress menu item, your zip file will be created in the same directory as the source file or folder. Note that on Windows, if you “open” the zip file, Windows will “look inside” the zip file as if it is an ordinary directory, but on Mac OS X, if you “open” the zip file, it will be decompressed and expanded back into a regular directory. 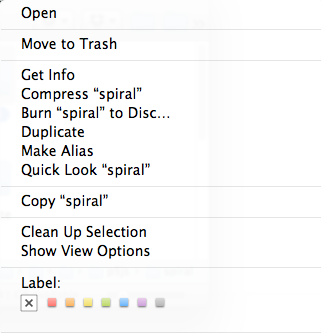 — I want just the spiral directory in a zip file. 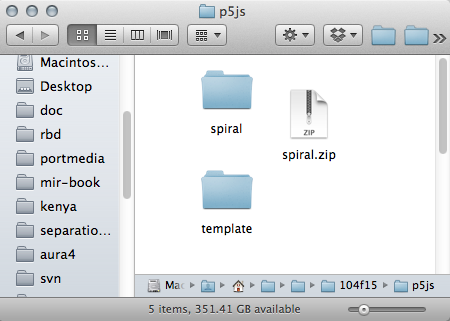 — now let’s unzip the file and make sure it’s all OK.
~/doc/class/104f15/p5js/tmp$ ls spiral — what is in spiral; did we get everything? 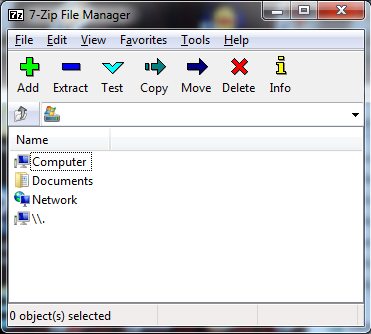 There are many programs for Windows that work with zip files, but none are built-in. 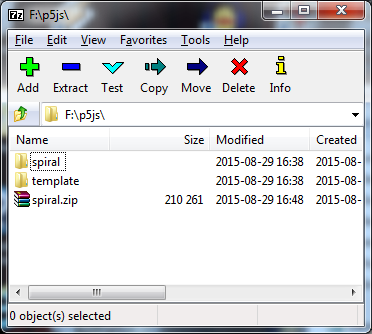 A simple-to-use program is 7-zip, which you can download from http://www.7-zip.org/. 7-Zip screen opened in Windows. Navigate to your project and select it. Click on the Add button (upper left). A dialog box opens in response to the “Add” button. Just click “OK”. 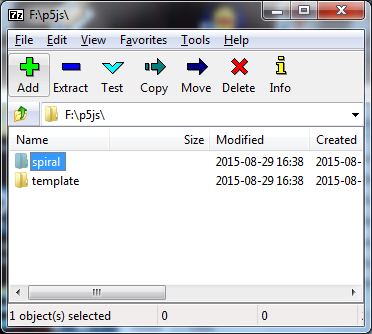 The new zip file should appear in the 7-Zip window.